This morning I was looking through Twitter and came across the below. A local air quality campaign was drawing the attention of an MP to a scrappage scheme for diesel vehicles. In summary, the proposal being floated by the Mayor of London Sadiq Khan is a scrappage scheme (costing £500m) for low income households and businesses with diesel cars and vans. The money could be used as a contribution for a car club membership or a new vehicle. The aim is to reduce emissions from the most polluting road vehicles entering city centres. In cities with high levels of air pollution, many see a quick win taking polluting vehicles off the road and offering money to replace them. 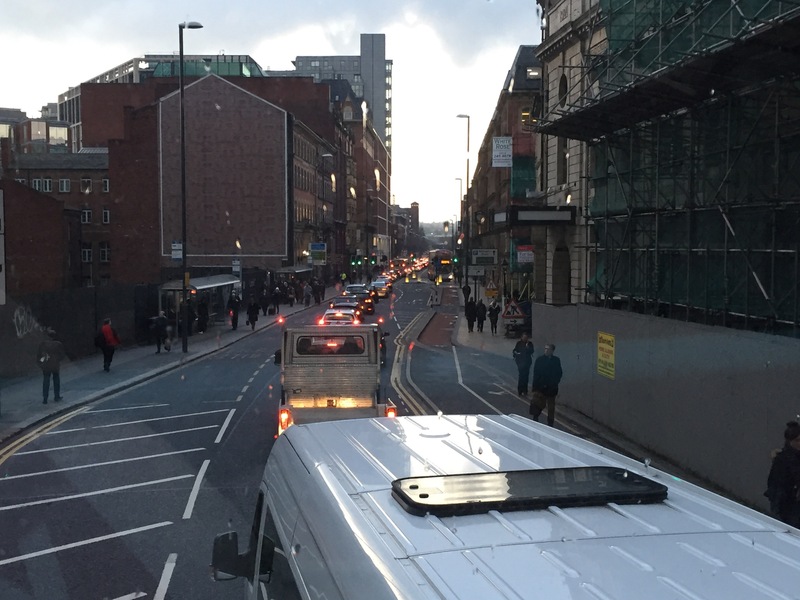 However, this is dealing with a symptom (polluting vehicles) rather than the cause (traffic congestion in the city centre). The problem with this scheme is that it is not a strong enough incentive to change travel patterns and help rebalance a city centre towards the modes that transport the most people sustainably such as public transport, walking and cycling. The big issue in city centres is the use of space. It is difficult to create additional space in a city centre without huge expense, so the already limited space needs to be changed. Replacing a diesel car with a petrol, hybrid or electric car will not decrease the demand for space for road vehicles. It doesn’t contribute towards the reduction of congestion that impacts the reliability of public transport, the safety of pedestrians/cyclists and the liveability of those cities for residents. We desperately need investment in infrastructure to align Leeds towards more sustainable and active forms of transport. Space allocated to general road use will need to be reallocated. Short term policies such as this won’t help Leeds and reinforce the continued use of private road vehicles. Demand for general road use will need to be lowered to create this space and one of the tools could be an emissions zone that penalises operators and drivers of the most polluting vehicles. It feels harsh! Telling people that instead of a few thousand in their pocket, they’re going to get penalised. Unfortunately, if you dont change your negative behaviour, it will cost you money. We won’t achieve any progress towards the goal of improving air quality and making cities more liveable by offering a subsidy that swaps one polluting, low density user of space for another that is slightly less polluting.